I am not a seafarer. I have heart palpitations if I get too close to the East River. But when my boyfriend Chris and I were on Paros, one of those pastoral Greek islands, I knew we would have to get out on the water (despite my morbid fear that Scylla would poke its head out of the deep and gobble me up). I asked Clea, the owner of Hotel Petres (our home base), if we could charter a boat. She suggested we link up with Captain Alexandros for a communal boat tour instead. Chris protested. He had nightmares about being trapped in the middle of the ocean with tourists, traditional music, and myth reenactments. But it was too late. I reserved two tickets for the next day's ride. (If I can face hydrophobia, he can face a little Greek music). 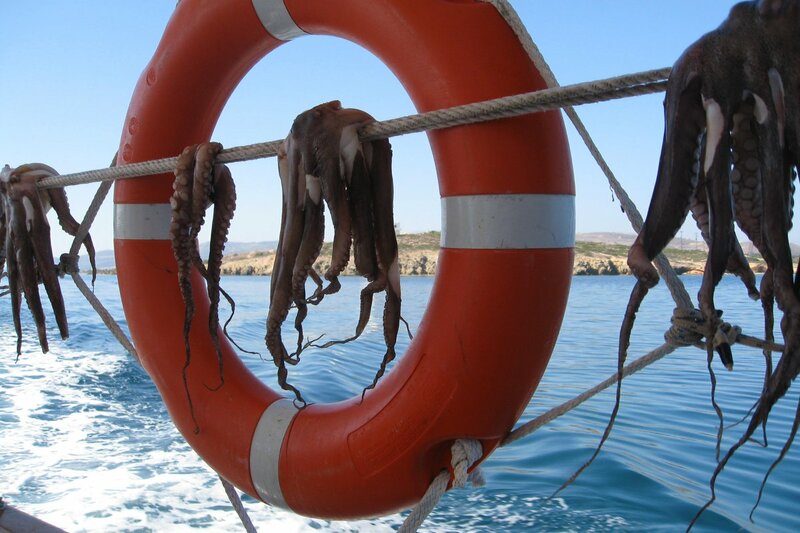 In the morning, we joined our brigade of extremely friendly (and somewhat stout) Greek men, a retriever, and enormous octopi hanging in the sun. Not a bad start. We jetted over the bluest, clearest water I have ever seen — towards promontory rocks with pristine, dollhouse churches perched on top. We paused and greeted a fisherman in his rowboat. We stopped in coves, between the rocks, and in the open sea to dive and swim. Chris donned his snorkel, and (eventually) I mustered up the courage to follow him. We pulled up to a deserted beach, and Captain Alexandros ignited his barbecue. He made a Greek salad. He cut open still-wiggling sea urchins. He grilled the octopi. We washed everything down with ouzo. He showed us how to scrub the plates in the sand, and noted how little fish eat leftover tzatziki from the plates. It was like nothing I had ever seen or done before. We approached Paros like Odysseus after a decade at sea — windswept, tan, exhausted, and recalling the best adventure of our lives.